This week’s TIME magazine issue includes an article called “‘We’re the People’: John Ford’s The Grapes of Wrath at 75” by long-time movie critic and editor Richard Corliss. 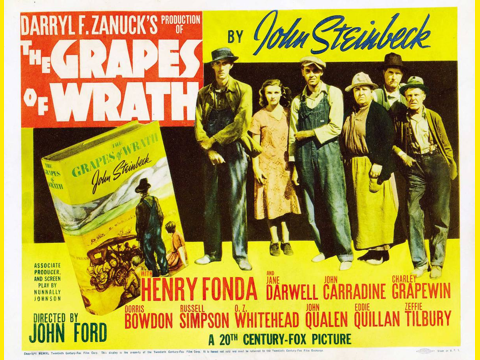 The man who reviewed The Grapes of Wrath for TIME had a more complex career biography. Before coming to the magazine in 1939, Whittaker Chambers had already written journalism and fiction for the Communist paper The Daily Worker, 1 translated Felix Salten‘s Bambi into English and served as a spy for the U.S.S.R. against the U.S. government. Riven by news of the 1938 Moscow Trials, Chambers defected from the Party and was hired by TIME. Toward the end of his tenure as Senior Editor, he was the star witness testifying against Alger Hiss in the most prominent espionage trial of the postwar years. TIME has harbored some famous movie critics — James Agee, Manny Farber, Richard Schickel—but none so notorious. See Corliss’ review here — which includes mention of a “vat of his conflicted political passions” poured into his otherwise review of the movie. See Chambers’ review of the Grapes of Wrath in the February 12, 1940, issue of TIME Magazine. Thank you for pointing out the mistakes in my précis of Whitaker Chambers’ early career in my GRAPES OF WRATH story. I have made the corrections. You are most welcome, and thank you for taking the time and pains to make such minor corrections. Just yesterday I read in the Brinkley biography of Henry Luce that Chambers’ review of Wrath was what brought him to Luce’s attention, and that Luce told everyone it was the best movie review that Time had ever published.